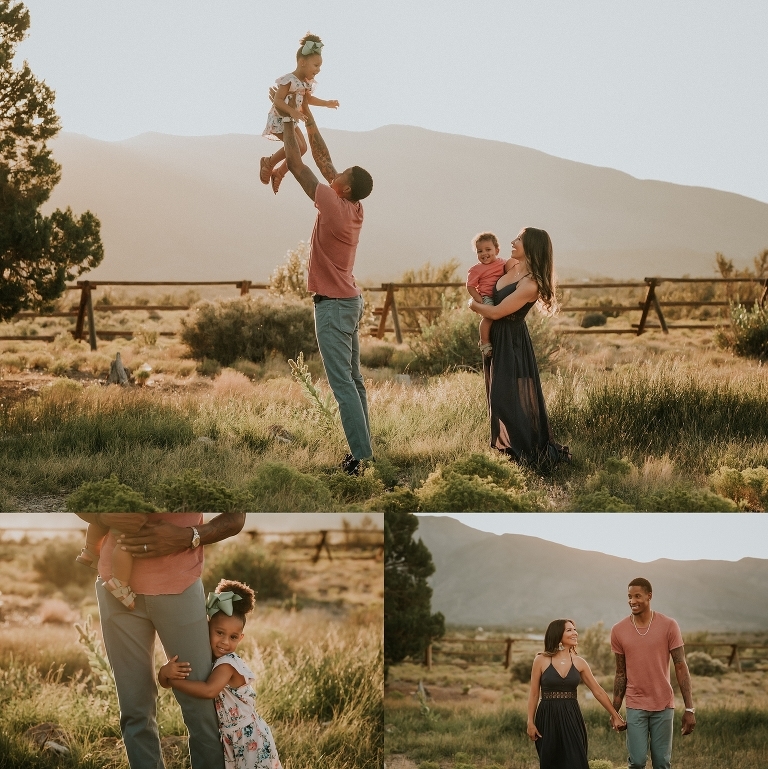 It is extremely hard to find a good spot outside of the city of Las Vegas to beat the heat for Family Portraits. The city is also not very kind to the Las Vegas Family Photography business. There are so many rules and regulations here. Luckily I have this gorgeous little well kept secret to photograph my families during the summer months. The light and scenic views here are well worth the drive. The Clyburn Family contacted me a few months ago to book a family portrait session during the summer months. With their busy family schedule, this is a prime time for them to get them done. We had a few hiccups along the way to completing their session and had to reschedule once. However, I think the final outcome of their images was well worth all the surprises we had along the way. Rescheduling also gave mom the ability to fine turn their wardrobe choices. I think they turned out absolutely fabulous! She certainly pulled together a beautiful color palette to compliment our location and season. It helps that her family is absolutely gorgeous too! I mean, how cute are her little ones! Three and One can be tough ages, but considering I always have lots of activities and ideas to provide for family portraits, I was able to capture some wonderful smiles and interactions. We working on a bit of a tight schedule, but I was able to really push my camera settings to utilize the very last light of the day. I was able to capture plenty of beautiful memories for this family and I can’t wait to share more. Here is a little sneak peek from their session. I hope you enjoy! Lifestyle Portrait Photographer specializing in unique, artistic and engaging Las Vegas Family Photography. Serving Las Vegas, N. Las Vegas, Henderson and the surrounding areas. Hello! Thank you so much for stopping by. Photography, to me, is a form of art. A way to capture a feeling or emotion of a fleeting moment in time. I go beyond traditional portrait photography by encouraging connection, natural interactions and lots of love and laughs. © 2016 Jamie Rubeis Photography|ProPhoto Photographer Blog|Design by Northfolk & Co.